Citation: Eftimiadi G, Vinai P, Eftimiadi C (2017) Staphylococcal Protein A as a Pharmacological Treatment for Autoimmune Disorders. 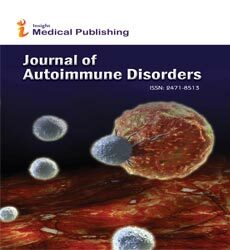 J Autoimmune Disord Vol 3:40. Copyright: © 2017 Eftimiadi G, et al. This is an open-access article distributed under the terms of the Creative Commons Attribution License, which permits unrestricted use, distribution, and reproduction in any medium, provided the original author and source are credited. Staphylococcal protein A (SpA) is a protective antigen expressed by Staphylococcus aureus that allows the bacterium to manipulate innate and adaptive host immune responses [1–6]. S. aureus is a commensal organism that forms part of the microbiome in healthy humans; however, under certain circumstances it can behave as an invasive pathogen and cause life-threatening infections. SpA, an immunoglobulin-binding protein, is expressed on the bacterial surface and is secreted freely into the extracellular environment as the bacterium grows . It is expressed by all S. aureus strains. SpA binds to the Fc portion of human and animal immunoglobulins, a defense mechanism that provides protection from opsono-phagocytic killing. Furthermore, SpA associates with the Fab portion of VH3-type IgM B cell receptors , mediating their cross-linking and leading to activation and clonal expansion of B lymphocytes  and their subsequent apoptotic collapse (Figure 1). Recombinant SpA (purified from Escherichia coli) does not induce B cell clonal expansion; rather, it induces collapse of VH3 clonal B cells directly [10,11]. It is worth noting that B lymphocytes that express VH3-encoded immunoglobulins play specific roles in various autoimmune diseases ; therefore, they may constitute effective pharmacological targets for the treatment of these diseases. Figure 1: Pharmacological effects of SpA binding to the Fab region of B cell receptors in ITP. B cells and plasma cells are involved in the pathogenesis of ITP. They are abnormally regulated and produce autoreactive antibodies, which bind platelets and megakaryocytes, inducing their impairment and/or phagocytic degradation in the spleen and liver. SpA binding to the Fab regions of the B-cell receptor promotes B-cells apoptosis and leads finally to inhibition of autoreactive antibody production and platelet degradation. SpA has high affinity for the Fc portion of IgG. IgG antibodies and IgG-containing circulating immune complexes can be selectively removed by extracorporeal exposure of a patient’s plasma to protein A immobilized on a matrix . In the 1990s, the US Food and Drug Administration approved a medical device containing SpA covalently linked to silica beads (PROSORBA®, Cypress Bioscience, Inc., San Diego, CA, USA) for plasma-adsorption treatment of patients with refractory rheumatoid arthritis (RA) or refractory immune thrombocytopenia (ITP). However, the “Guidelines on the Use of Therapeutic Apheresis in Clinical Practice”  state the following: “Improvement in ITP may result indirectly from in vivo immunomodulation by the release of protein A into the patient, which can induce targeted B cell depletion”. Indeed, leakage of protein A from the matrix, probably due to the activity of serum protease, is thought to occur [13,15]. SpA has been tested in animal models and has proved to be a successful treatment for several autoimmune pathologies; for example, SpA alleviates antibody-induced nephritis and renal failure associated with systemic lupus erythematosus in mice . In addition, the efficacy of SpA as a therapeutic agent was evaluated in a murine model of collagen-induced arthritis (CIA) , which mimics RA in humans. SpA can co-opt circulating IgG molecules and form small, defined hexameric complexes that interact with monocytes, macrophages, and pre-osteoclasts. Formation of these complexes results in Fcγ receptor type I-dependent polarization of macrophages to a regulatory phenotype (Figure 2), thereby rendering them unresponsive to activators such as interferon-γ. The anti-inflammatory complexes can also directly inhibit differentiation of human pre-osteoclasts into osteoclasts “in vitro” (Figure 2). Moreover, administration of SpA during the early stages of disease alleviates the clinical and histologic erosive features of CIA in mice . Figure 2: Pharmacological effects of SpA binding to the Fc region of IgG in RA: the anti-inflammatory role of the immune complexes formed. Monocytes can differentiate into either macrophages or osteoclasts depending on their response to specific biological signals. These cells are a primary source of the inflammatory environment that produce synovial and erosive lesions. Spa binds to the Fc portion of circulating IgG and generates small hexameric immunoglobulin complexes (IgG2SPA)2 that interact with monocytes, macrophages, and pre-osteoclasts. Formation of these complexes results in Fcγ receptor type I–dependent polarization of macrophages to an anti-inflammatory regulatory phenotype and inhibits pre-osteoclasts differentiation into osteoclasts. Ultrapure SpA has been used to successfully treat a murine model of ITP (PRTX-100, Protalex, Inc., Florham Park, NJ, USA) . ITP is an autoimmune bleeding disorder in which autoantibodies or immune complexes bind to platelet surface antigens; autoreactive T cells then target and destroy platelets and megakaryocytes in the spleen and bone marrow. Platelet counts in mice treated with PRTX-100 increase to normal levels within 1–2 weeks, and none of the mice die during the experiments . Toxicology studies have also been performed in monkeys . The monkey is considered to be the best predictive animal model due to its similarity to humans with respect to SpA binding to IgG, B cells, and monocyte/macrophages. Weekly intravenous doses of SpA (up to 100 μg/kg) are well-tolerated and essentially non-toxic. The majority of treated monkeys develop antibodies against SpA. However, no evidence of a hypersensitivity response is observed. Two single-dose Phase I studies examined the safety, pharmacokinetic, immunogenicity, and pharmacodynamic activity of highly purified SpA in human volunteers . The majority of subjects developed detectable anti-protein A antibodies after dosing, with no evidence of a hypersensitivity response. A notable pharmacodynamic effect is a transient post-dose reduction in circulating lymphocytes. SpA dosing increases transcription of multiple genes regulated by type-1 interferons in peripheral blood mononuclear cells; up-regulation of several such genes correlates with the degree of lymphopenia observed 24 h after dosing. This study demonstrates for the first time that small intravenous doses of SpA (0.3–0.45 μg/kg) are safe and well-tolerated in humans. Following this first toxicological study, a Phase Ib randomized, double-blind, placebo-controlled, dose-escalation study of ultrapure SpA (PRTX-100) and methotrexate was conducted in patients with active RA . The most common treatment-related adverse events are nausea, muscle spasms, dizziness, flushing, fatigue, worsening of RA, and headache. However, most cases of drug-related RA flares are followed by prolonged reductions in RA activity, along with improved symptoms and a reduction in swollen joint counts. No serious adverse events are related directly to SpA (PRTX-100), and none occur in the group receiving the highest dose. As shown in the previous study , the majority of subjects develop detectable anti-protein A antibodies, with no evidence of a hypersensitivity response. Although this study did not determine the highest dose of PRTX-100 that could be administered to RA patients on a weekly basis with acceptable toxicity, the results suggest that, at least at the two highest doses tested, PRTX-100 has a positive effect on disease activity. These findings warrant further Phase 2/3 clinical trials to confirm the positive results and to verify if the reduction of RA activity is temporary or permanent. The promising results obtained in the mouse model of ITP , and the promising preclinical data indicating that the drug has the potential to treat ITP by reducing immune-mediated destruction of platelets, support further investigations to evaluate the safety and efficacy of SpA in ITP patients. Data from initial cohorts in two dose escalation trials (PRTX-100 at a dose of 1 μg/kg or 3 μg/kg)  demonstrate an acceptable safety profile, and support continued enrolment of higher-dose cohorts. In one of the trials, a platelet response is observed in one of six patients treated with the lowest dose. Clinical trials examining higher-dose cohorts are underway , and updated data from patients treated in Phase 1/2 and European Phase 1b studies will be released in the future. Our proposal to extend experimentation of SpA to the pharmacological treatment of autoimmune movement disorders arose from a clinical case involving a girl with Tourette syndrome . This case presented with characteristics that are similar to those of cases of PANDAS (Pediatric Autoimmune Neuropsychiatric Disorders Associated with Group A Streptococcal Infections), a clinical condition in which tics and obsessive compulsive disorders follow acute Streptococcus pyogenes infections [25,26]. The child presented with high titers of anti-streptolysin O (ASO) and anti-strepto DNase (DNase-B) antibodies and showed a positive reaction to four autoimmunity tests (out of a panel of five) that detect the presence of autoantibodies against brain antigens (Moleculera Labs, Oklahoma City, OK, USA). The assays measure the titers of antibodies against dopamine D1 and D2 receptors , lysoganglioside-GM1, and beta-tubulin, in addition to antibodies that activate calcium/calmodulin-dependent protein kinase type II (CaM kinase II) by binding to receptors on neural cell lines. Microbiological monitoring indicated that the child was an intermittent nasopharyngeal carrier of S. aureus, and that a significant improvement in motor tics occurred during the S. aureus colonization phase. The nostril is the main ecological niche in which S. aureus resides, although the genetic and environmental determinants of carrier status are not fully understood. At any moment in time, about 20% of the general population carries S. aureus, while ~30% are transient carries and ~50% are non-carriers [28,29]. A complex immunological equilibrium exists between host defense mechanisms and the differential expression and roles of S. aureus virulence determinants during colonization and disease . This clinical case was of much interest to us because of the observed “see-saw effect” between the host immune response and tic expression. A significant improvement in motor tics occurs during the S. aureus colonization phase (nasopharyngeal-, oropharyngeal-, and gut-positive bacterial cultures). Furthermore, the colonization phase is associated with downregulated production of antibodies against Streptococcus pyogenes (the etiological agent of PANDAS) and, most importantly, of autoantibody production against D1 and D2 dopamine receptors. Dopamine is a crucial neurotransmitter required for motor control; autoimmune reactions against its neuronal receptors may alter central dopamine pathways and lead to movement and neuropsychiatric disorders, especially in childhood. After decolonization, clinical conditions revert to the poor scores previously observed with a parallel increase of antistreptococcal antibody production. This result was consistent with data from animal models showing that a proinflammatory Th17 cell-associated immune response is required for S. aureus nasal decolonization . Ultimately, the colonization phase triggers an immunomodulatory response, whereas the clearing process triggers a pro-inflammatory response. A sequential “uncoupling” of the anti-inflammatory and pro-inflammatory phenomena occurs. These results confirm data from other authors indicating that the pro-inflammatory and anti-inflammatory properties of S. aureus are uncoupled and can be expressed separately . Several components of the S. aureus cell wall exert anti-inflammatory effects by mediating IL-10 production in macrophages and by downregulating pro-inflammatory cytokine responses, thereby circumventing Th1/Th17 adaptive immune responses during infection . However, the S. aureus virulence determinants expressed during colonization and infection are different . SpA is a virulence factor released extracellularly at an early stage to promote both colonization and immune evasion . The beneficial downregulation of antibody production observed during the S. aureus colonization phase suggests, albeit indirectly, possible involvement of SpA in the process. The safety, tolerability, and pharmacokinetics of SpA in animal models, and of ultrapure SpA (PRTX-100) in human studies, together with encouraging preclinical data, suggest that this protein could soon be utilized as an effective treatment for selective autoimmune disorders such as RA and ITP. Clinical trials are ongoing. The improvement of motor tics accompanying reduced production of autoantibodies against D1 and D2 dopamine receptors supports our proposal to include SpA in new clinical trials aimed at identifying innovative pharmacological strategies for the treatment and management of autoimmune neuropsychiatric and movement disorders. Falugi F, Kim HK, Missiakas DM, Schneewind O (2013) Role of Protein A in the Evasion of Host Adaptive Immune Responses by Staphylococcus aureus. MBio 4: e00575-13. Kim HK, Kim HY, Schneewind O, Missiakas D (2011) Identifying protective antigens of Staphylococcus aureus, a pathogen that suppresses host immune responses. FASEB J 25: 3605–3612. Hong X, Qin J, Li T, Dai Y, Wang Y, et al. (2016) Staphylococcal Protein A Promotes Colonization and Immune Evasion of the Epidemic Healthcare-Associated MRSA ST239. Front Microbiol 7: 951. Kobayashi SD, DeLeo FR (2013) Staphylococcus aureus Protein A Promotes Immune Suppression. MBio 4: e00764-13. Thammavongsa V, Kim HK, Missiakas D, Schneewind O (2015) Staphylococcal manipulation of host immune responses. Nat Rev Microbiol 13: 529-543. Kim HK, Falugi F, Thomer L, Missiakas DM, Schneewind O (2015) Protein A Suppresses Immune Responses during Staphylococcus aureus Bloodstream Infection in Guinea Pigs. MBio 6: e02369-14. Becker S, Frankel MB, Schneewind O, Missiakas D (2014) Release of protein A from the cell wall of Staphylococcus aureus. Proc Natl Acad Sci U S A 111: 1574–1579. Roben PW, Salem AN, Silverman GJ (1995) VH3 family antibodies bind domain D of staphylococcal protein A. J Immunol 154: 6437–6445. Kim HK, Falugi F, Missiakas DM, Schneewind O (2016) Peptidoglycan-linked protein A promotes T cell-dependent antibody expansion during Staphylococcus aureus infection. Proc Natl Acad Sci U S A 113: 5718–5723. Goodyear CS, Silverman GJ (2003) Death by a B cell superantigen: In vivo VH-targeted apoptotic supraclonal B cell deletion by a Staphylococcal Toxin. J Exp Med 197: 1125–1139. Silverman GJ, and Goodyear CS (2006) Confounding B-cell defences: lessons from a staphylococcal superantigen. Nat Rev Immunol 6: 465–475. Foreman AL, Van de Water J, Gougeon ML, Gershwin ME (2007) B cells in autoimmune diseases: Insights from analyses of immunoglobulin variable (Ig V) gene usage. Autoimmun Rev 6: 387–401. Silverman GJ, Goodyear CS, Siegel DL (2005) On the mechanism of staphylococcal protein A immunomodulation. Transfusion 45: 274–280. Szczepiorkowski ZM, Bandarenko N, Kim HC, Linenberger ML, Marques MB, et al. (2007) Guidelines on the use of therapeutic apheresis in clinical practice: evidence-based approach from the Apheresis Applications Committee of the American Society for Apheresis. J Clin Apher 22: 134. Balint JP, Jones FR (1995) Evidence for proteolytic cleavage of covalently bound protein a from a silica based extracorporeal immunoadsorbent and lack of relationship to treatment effects. Transfusion Science 16: 85–94. Viau M, Zouali M (2005) Effect of the B cell superantigen protein A from S. aureus on the early lupus disease of (NZB$\times$ NZW) F 1 mice. Mol Immunol 42: 849–855. MacLellan LM, Montgomery J, Sugiyama F, Kitson SM, Thümmler K, et al. (2011) Co-Opting Endogenous Immunoglobulin for the Regulation of Inflammation and Osteoclastogenesis in Humans and Mice. Arthritis Rheum 63: 3897–3907. Semple JW, Speck ER, Aslam R, Kim M, Zufferey A, et al. (2015) Successful Treatment of Thrombocytopenia with Staphylococcal Protein A (PRTX-100) in a Murine Model of Immune Thrombocytopenia (ITP). Blood 126: 1045. Bernton E, Haughey D (2014) Studies of the safety, pharmacokinetics and immunogenicity of repeated doses of intravenous staphylococcal protein A in cynomolgus monkeys. Basic Clin Pharmacol Toxicol 115: 448–55. Ballow C, Leh A, Slentz-Kesler K, Yan J, Haughey D, et al. (2013) Safety, pharmacokinetic, immunogenicity, and pharmacodynamic responses in healthy volunteers following a single intravenous injection of purified staphylococcal protein A. J Clin Pharmacol 53: 909–918. Bernton E, Gannon W, Kramer W, Kranz E (2014) PRTX-100 and methotrexate in patients with active rheumatoid arthritis: A Phase Ib randomized, double-blind, placebo-controlled, dose-escalation study. Clin Pharmacol Drug Dev 3: 477–486. Bussel JB, Kuter DJ, Audia S, Francovitch RJ, Michel M (2016) Safety and Efficacy of PRTX-100, a Highly Purified Form of Staphylococcal Protein A, in Patients with Immune Thrombocytopenia (ITP). Blood 128: 4929. Protalex, Inc. (2017) Open-Label, Dose Escalation Study of PRTX-100 in Adults With Persistent/Chronic Immune Thrombocytopenia. ClinicalTrials.gov. Eftimiadi C, Eftimiadi G, Vinai P (2016) Staphylococcus aureus Colonization Modulates Tic Expression and the Host Immune Response in a Girl with Tourette Syndrome. Front Psychiatry 7. Swedo SE, Leonard HL, Garvey M, Mittleman B, Allen AJP, et al. (1998) Pediatric Autoimmune Neuropsychiatric Disorders Associated With Streptococcal Infections: Clinical Description of the First 50 Cases. AJP 155: 264–271. Swedo SE, Grant PJ (2005) Annotation: PANDAS: a model for human autoimmune disease. J Child Psychol Psychiatry 46: 227–234. Cunningham MW, Cox CJ (2016) Autoimmunity against dopamine receptors in neuropsychiatric and movement disorders: a review of Sydenham chorea and beyond. Acta Physiol 216: 90–100. van Belkum A, Verkaik NJ, de Vogel CP, Boelens HA, Verveer J, et al. (2009) Reclassification of Staphylococcus aureus Nasal Carriage Types. J Infect Dis 199: 1820–1826. Sollid JUE, Furberg AS, Hanssen AM, Johannessen M (2014) Staphylococcus aureus: determinants of human carriage. Infect Genet Evol 21: 531–541. Brown AF, Leech JM, Rogers TR, McLoughlin RM (2014) Staphylococcus aureus Colonization: Modulation of Host Immune Response and Impact on Human Vaccine Design. Front Immunol 4. Archer NK, Harro JM, Shirtliff ME (2013) Clearance of Staphylococcus aureus Nasal Carriage Is T Cell Dependent and Mediated through Interleukin-17A Expression and Neutrophil Influx. Infect Immun 81: 2070–2075. Peres AG, Stegen C, Li J, Xu AQ, Levast B, et al. (2015) Uncoupling of pro- and anti-inflammatory properties of Staphylococcus aureus. Infect Immun 83: 1587–1597. Frodermann V, Chau TA, Sayedyahossein S, Toth JM, Heinrichs DE, et al. (2011) A modulatory interleukin-10 response to staphylococcal peptidoglycan prevents Th1/Th17 adaptive immunity to Staphylococcus aureus. J Infect Dis 204: 253–262. Jenkins A, Diep BA, Mai TT, Vo NH, Warrener P, et al. (2015) Differential Expression and Roles of Staphylococcus aureus Virulence Determinants during Colonization and Disease. MBio 6: e02272-14.